P.B. 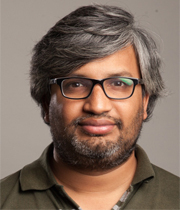 Sujit is an Associate Professor at the Indraprastha Institute of Information Technology, New Delhi, India. He received the bachelor's degree from Bangalore University, India, in 1998, Master's degree from Visveswaraya Technological University, India, in 2002, and Ph.D. from the Indian Institute of Science, Bangalore, India, in 2006. Earlier, he was a Research Scientist at Universidade do Porto, Portugal and Post-Doctoral Fellow in Brigham Young University, Provo, Utah. Unmanned aerial vehicles, underwater vehicles, multi-robot systems, guidance and control, and human-robot interaction. Multi-agent systems, Robotics, and Controls.